I love a good time freezing Bullettime effect. And we have shared quite a few rigs on the blog. All with varying degrees of sophistication and effort. From a LO-FI pinhole rig, through a crowd funded version to a high end light painting 360 rig. And quite a few others too. They all had one thing in common, after taking the footage with the multi-camera rig needed a significant amount of post processing time to create the bullet time effect, making it practically unfitted for live event coverage. The engineers at broadcast company NHK, are doing it differently. Using a dedicated control console, a central processor and an array of cameras they are able to provide real time bullettime effect. 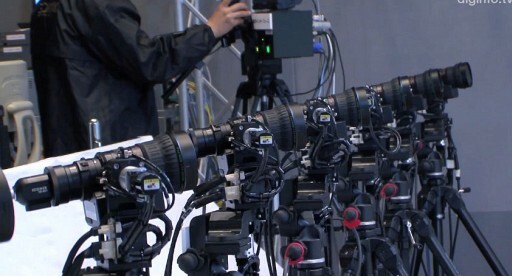 The camera array is build of multiple cameras, each equipped with a motorized pan/tilt head and a motorized zoom. 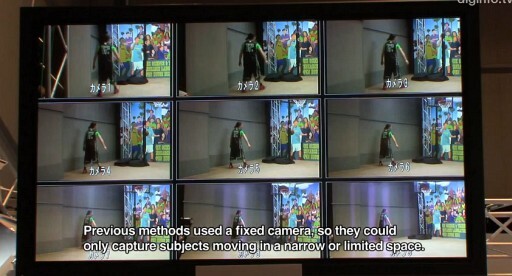 All of which are controlled via the console while the computer makes sure the images are aligned for bullettime effect. 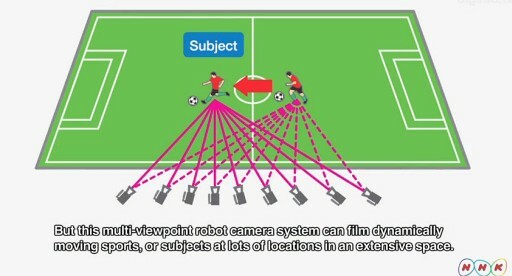 Interestingly, the use of a multi-camera array not only makes it possible to have an on-demand bullettime effect, but also provides instant multi-angle 3D view. I can’t wait for the 2016 Olympics now. Wow this is super cool, thanks for sharing.